Brighten and save on your outdoor and indoor lighting with our LED corn light bulb with a top-of-the-line 50,000-hour-rated Epistar chip (One of the largest manufacturers of light-emitting diodes) and a 60,000-hour-rated Sunon fan that you can rely on. Our commercial and industrial grade LED lighting is constructed with heavy-duty corrosion resistant materials. These LED corn light bulbs can replace high intensity discharge (HID), high pressure sodium (HPS), incandescent, and metal halide (MH) luminaires. DLC-tested, those requirements must be completed by an accredited laboratory. DLC is a utility-based initiative and numerous utilities nationwide base rebate programs on DLC standards. Don't be fooled by other old technology. Our lights are made in 2017 with the newest tech, verified by the date code on the box. EverWatt produces LED retrofit lighting, LED corn lights, and fixtures to replace CFLs, metal-halides, high-pressure sodium lights, etc. 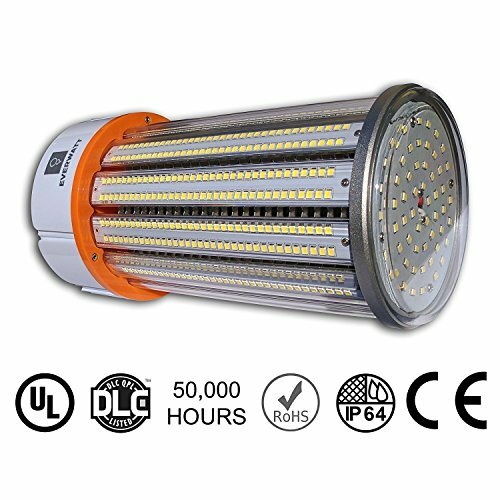 We focus on high-value, high efficiency, long-lasting LED lights. Head to our website to see the full selection of LED light bulbs, high bay LED lights, LED flood lights, street lights, lighting for warehouses and parking lots, etc. EASY INSTALLATION - Bulb comes in 4000k, 5000k, 6000k light temperatures, and has an E39 mogul screw base, making it a super easy LED retrofit and incandescent/metal-halide replacement. In most cases, just screw in. In others, since LEDs use a driver and not a ballast, you must bypass the ballast (Halide and other bulb types). Consult your electrician. LATEST TECHNOLOGY, LONG LIFE - Our E39 LED corn bulb style retrofit bulbs are made in 2017 with the newest tech, verified by the date code on the box. Uses LED SMD2835 2.0 Technology to obtain 115-150 lumens per watt (depending on the enclosure) and project light in a 360-degree fashion. Bulb is rated to last 23 years assuming 6 hours of usage per day.